I’ve already caught some pips off a Cable short trade, but I think this downtrend could keep going on so I’m trying to sell the rallies. 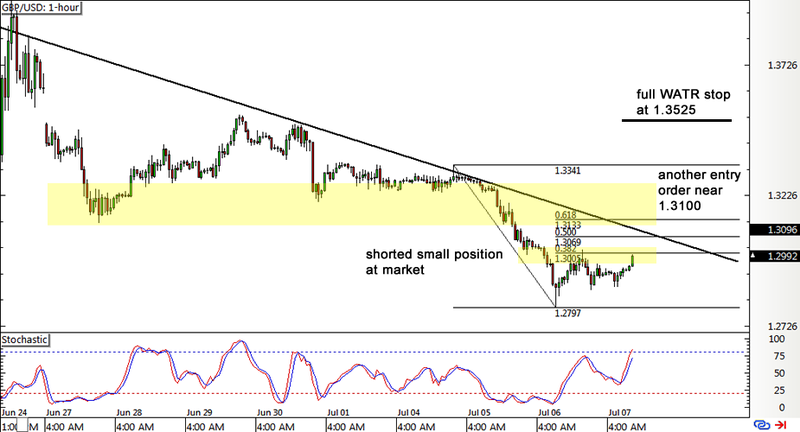 Take a look at this GBP/USD retracement setup! A descending trend line can be drawn to connect the recent highs of price action on the pair’s 1-hour time frame, and this resistance area lines up with the Fib levels on the latest swing high and low. In particular, the 61.8% Fib is close to an area of interest around 1.3100-1.3150, which might hold as a ceiling for any rallies. However, I’m also seeing a short-term resistance area at the 1.3000 major psychological level, which is around the 38.2% Fibonacci retracement level. I’ve decided to put a nibbler short position (0.25%) risk right there and another short entry at 1.3075 near the trend line. Stochastic is nearing the overbought area anyway, which suggests that this pullback might be over soon. Updates from the U.K. haven’t been so good, as news reports are showing that more property funds are refusing client withdrawals, adding to the stress on the banking sector. Financial analysts are already warning that this situation is troubling since putting large amounts of capital on lockdown could cause further panic among investors. For me, this just marks the tip of the iceberg in this Brexit fallout so I’m thinking sterling could keep dropping as traders anticipate some form of stimulus from the BOE. As for the U.S. dollar, I’m eager to find out how the June payrolls might turn out as the odds seem skewed for an upside surprise… or at least that’s what my buddy Forex Gump thinks. Although a strong jobs reading might not be enough to convince market watchers that the Fed would hike rates soon, I think it could still add to the dollar’s shine since the U.S. economy seems to be doing fairly well so far while other economies are facing stronger headwinds. Shorted GBP/USD at market (1.2990) for 0.25% risk, another short order at 1.3075 for another 0.25% risk. I set a wide full weekly ATR stop at 1.3525 to account for potentially strong volatility, and I’ll be trailing this stop lower to lock in gains along the way. I’ll also be ready to add to my position if bearish momentum keeps picking up so stay tuned! As always, remember to never risk more than 1% of a trading account on any single trade. Adjust position sizes accordingly. Create your own ideas and don’t simply follow what I do.